Not all test equipment needs to be expensive. Here are a few helpful tools that won’t break the bank. Electricians doing residential, commercial or industrial work need to know with absolute certainty whether a wire or terminal is live and whether a given piece of electrical equipment is energized at the power input terminals. Usually, for this type of preliminary test, the connections need only be checked for the presence of the supply voltage. An excellent tool for this is the neon test light. Electricians quickly learn to distinguish between the faint glow caused by phantom voltage and the bright light indicating full-scale utility power. A simple incandescent bulb and neon test light are both quick and dirty test instruments for ac. Also, the intensity of the light varies markedly between 120 and 240 V, so the neon test light is ideal for quickly troubleshooting an entrance panel or load center and determining the status of individual circuits at the breaker outputs. AC and dc can be distinguished by observing whether both electrodes inside the bulb or just one of them glows. By adding a diode, dc polarity can be determined. In ac premises systems, it is easy to differentiate between ground and hot lines by making comparison measurements. In checking branch-circuit receptacles, nothing surpasses the simple clear glass appliance bulb screwed into a plug-in socket. These are easy to use in this application; with a multimeter, you never know exactly when the probes are making contact. The small appliance bulb, with a tight radius, resists breakage in the toolbox, and the filament can be visually inspected before each use. Because they can be seen from a distance, several plug-in bulbs can be used throughout a room when troubleshooting circuits. Of course, every electrician needs a multimeter. These range from small digital testers that can be bought in a big box store for under $10 to really superb instruments such as the Fluke Model 289, successor to the venerable Model 287, which sells for over $500. An instrument in this class is noted for rugged construction and a broad array of features such as capacitor and diode test functions. The clear readout and long battery life are advantages. A Fluke 8845a benchtop multimeter. The hand-held multimeter is excellent for outdoor fieldwork, on the factory floor, and for bench work where speed and reasonable accuracy are required. In the lab, a bench model multimeter is accurate and has additional features, such as four-wire probing to enhance the accuracy of low-resistance measurements. Digital multimeters are generally more accurate than their old analog counterparts. Analog meters usually only guarantee accuracy levels of between 3 and 5%. Typical handheld DMMs advertise accuracy levels of around 0.5% and many bench digital multimeters quote figures of around 0.01%. Measurements of ac parameters are generally most accurate at 50 and 60 Hz because manufacturers optimize the meters for those frequencies. A Fluke 289 handheld multimeter. The Fluke 8845A bench model is a 6.5-digit precision multimeter that sells for just under $1,100. It comes with an extensive test lead set. It has an ac current probe with BNC connector available. Some of the functions include relative readings, decibel and power measurement, touch-hold functions and computer interface capability. Another piece of test equipment, widely used by electricians and for power quality work, is the clamp-on ammeter. For years, this instrument was available only in an analog version. Most users prefer today’s digital model, although an old analog clamp-on model is viable and even preferable for outdoor work when the ambient temperature is low. Selling for around $150, Amprobe makes clamp-on meters that measure ac currents of 800 A or more. Linear and nonlinear loads can be measured, providing a true RMS readout. A clamp-on ammeter does not directly measure such high current levels, i.e. the current does not flow through the instrument. Instead, it measures the magnetic field that surrounds the conductor. A voltage is generated internally that is shown at the readout, calibrated to indicate current flowing through the conductor, without touching or interrupting the circuit. A clamp-on meter with a splitter receptacle. The user opens the instrument’s jaws, then closes them around the conductor, without piercing or affecting the electrical insulation. The amount of current in the live circuit immediately displays. The conductor needn’t be centered in the jaws, and it does not matter if the wire passes through at an angle. It is not possible to measure the current in a cable that contains a two-wire circuit because hot and neutral currents flow in opposite directions, canceling out and giving a zero reading. To make such a measurement, it is necessary to find a single conductor such as in a junction box or load center, or within the equipment enclosure. Alternatively, a circuit splitter can be made from a short extension cord segment, the jacket slit and one conductor pulled out. Three clamp-on ammeters can be used together in the hold mode to monitor a three-phase circuit over an extended period to check for maximum phase imbalance. An important instrument that goes beyond routine capacitor and inductor measurements is the LCR meter. Advanced models measure true capacitance and inductance in addition to the actual equivalent series resistance of capacitors and the Q factor of inductors. To initiate the measurement, ac voltage is applied to the reactive component. The frequency of this voltage is set by the user, depending upon the approximate value of the device under test. Then, the instrument sees both the voltage across and the current through the component or system under test. It measures the phase angle between the voltage and current. Then, the equivalent capacitance or inductance as the case may be, combined with the calculated impedance, appears in the display. A primary function of the LCR meter is to detect series or parallel resistance. Usually, LR measurements show the elements in series and CR measurements have the elements in parallel. The pricing of LCR meters resembles that of multimeters. Hand-held versions can be had for under $100. Benchtop meters can be found for a few hundred dollars (used, on eBay) on up to $1,000 or more. 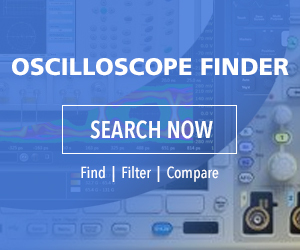 In electronics labs, the most ubiquitous instrument is the oscilloscope. These instruments once used cathode ray tubes. A camera could attach to the screen to take screen shots. Today, virtually all vendors offer triggered-sweep digital storage instruments capable of both time-domain and frequency-domain representations. USB slots enable peripheral devices such as a standard computer keyboard, networking by means of internally generated HTML to any browser-equipped computer on a local area network. A flash drive inserted into a USB slot can save screenshots or setups. The spectrum analyzer resembles its venerable ancestor, the oscilloscope, but it is a little more complex and involves a steeper learning curve. Not that the basic idea is at all obscure. What may be challenging to first-time users is the instrument’s many controls and functions. It displays a frequency domain representation of the signal applied to its input, and we are familiar with that from the oscilloscope’s FFT function in the math mode. But it may be difficult to get a display other than the instrument’s noise floor. To begin, start frequency, stop frequency and span must be set correctly, as well as resolution bandwidth (RBW). And Autoset does not always come to the rescue. Start, Stop and Span tend to interact and jump around in an obscure fashion, and it takes some patience to bring them into alignment. The solution is to practice using signals of known frequency and amplitude, consult the user’s manual, and watch the many relevant YouTube videos. The spectrum analyzer has many applications. Waveforms, viewed in the frequency domain, are decomposed into their discrete components and displayed across the spectrum with power amplitudes shown on a decibel scale. Consequently, it becomes possible to visualize the electromagnetic environment at a given time and place. The spectrum analyzer is appropriate for other uses, including checking proposed cell tower and repeater sites, scanning buildings for listening devices, and similar tasks.